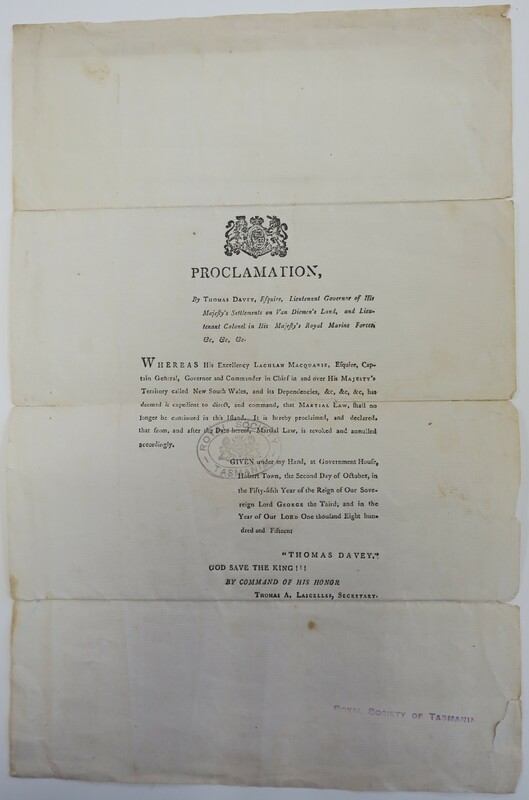 A number of printed proclamations and government notices from the early part of 1815 survive in the Colonial Office files in TNA. Some or all of these may well have been printed by Bent given his statement that he was appointed Government Printer in 1815, and that the last surviving appearance of George Clarke as Government Printer is in the Van Diemen’s Land Gazette for Sep. 10/24 1814. 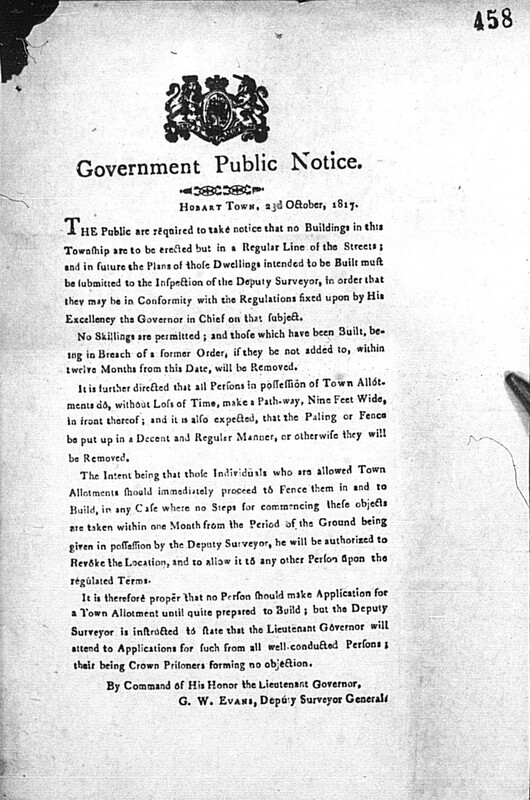 As none of these early 1815 notices bear the printer’s name it is impossible to be certain. There is some variation in style and skill level but no clear cut change that enables any of them to be attributed definitively to either Clarke or Bent. It is possible that they represent the changeover period when Bent was assisting Clarke and that both printers made a contribution during the time of the bushranger crisis. From Sep. 1815 any dated government printing can be definitely ascribed to Bent. Some items in the following list which are undated or bear printed date 181- may possibly have been printed earlier by Clarke. 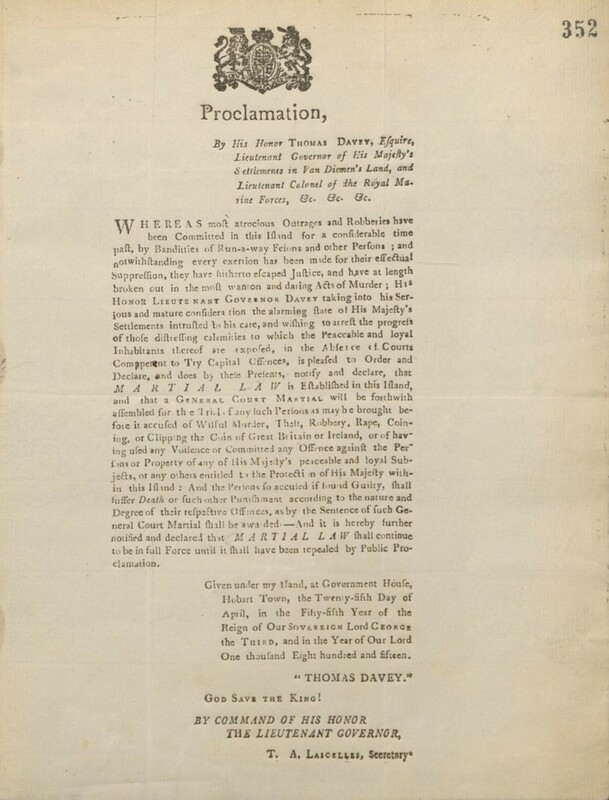 Proclamation revoking Martial Law 2 Oct 1815. The earliest surviving imprint where Bent’s name is given as Government Printer. Government Public Notice. Hobart Town, 23d October, 1817.